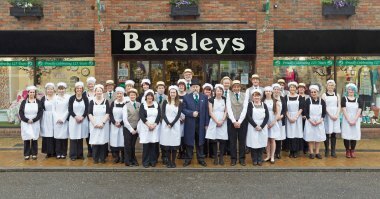 The roots of the family business of Barsley’s Department Store go back to 1891 when Charles Barsley took over the running of a tailoring establishment in Brenchley. Charles Barsley was the eldest of the eleven children of a master tailor and draper of KIMPTON in Hertfordshire. He had qualified with a diploma in Garment Cutting at the “Tailor and Cutter” academy. He travelled around the locality by bicycle or by horse and cart, measuring his clients in their homes: other customers called at the shop, where there was a tailoring workshop employing three to four men. By 1900 he had increased trade to a degree sufficient to enable him to open a shop in Paddock Wood, a relatively new village thriving on the benefits of a railway station and the annual influx of hop-pickers. In 1903 he purchased Alma Cottages in Commercial Road , Paddock Wood (which was then in the Parish of Brenchley) and enlarged the building to accommodate a shop. This was on the site of our present store. In 1919 the Brenchley shop was closed down and all efforts were concentrated on the Paddock Wood business. Workshops which had been producing military uniforms during the war now began to turn out inexpensive ready-made civilian clothes and so, as the demand for home tailoring decreased, Barsley’s extended their trade to include footwear and outfitting. Charles son Bob was apprenticed to C.E. White, the Tunbridge Wells mens’ outfitter and he in turned joined the family business in 1934. In 1940 Charles Barsley died and after the war Bob extended the Commercial Road premises still further. In 1952 the acquisition of further buildings in Station Road enabled Barsley’s to open Drapery, Haberdashery, Soft Furnishings and ladies’ Wear Departments: In 1961 an extension to the rear of the Commercial Road property was built and a furniture and carpet department opened it was at about this time that what had been Turner’s Printing Shop next door, also became part of Barsleys. Between 1968 and 1970 further construction was carried out to re-build the Station Road part of the shop and join it to the Commercial Road building. Charles Barsley’s grandson John, joined the firm in 1972 after training in linens, soft furnishings, curtain making and drapery at Noakes’ of Tunbridge Wells. He was followed in 1974 by his brother Richard, who was trained in clothing and outfitting at Sharp’s of Maidstone. In 1980 Andrew Chacksfield joined the company to run the Furniture and Carpet Department. In 1987 the original cottages that formed the shop were demolished and the front of the store rebuilt. In 2000 the premises facing Station Road were extended and a lift installed – this has enabled customers easier access to the first floor and coffee shop. Many people have complimented Barsleys on their updated look which still maintains personal service to customers. Barsleys look forward to serving you well through the next century.